Experience more freedom and outstanding performance from your riveting tools with cordless tools from STANLEY Engineered Fastening. The ProSet® PB2500 is a lightweight tool with excellent ergonomics, great strength and many added features. The PB2500 ensures high productivity and improves your return on investment with very low installation cost. Both the PB3400 and PB2500 will place the same breakstem rivets as the complete ProSet® and Genesis® series, with no exceptions. Long lasting battery capable of placing an average of 1,200 ø4,8mm standard breakstem rivets per charge. 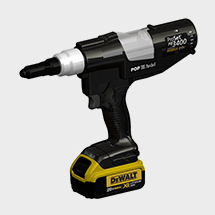 The ProSet® PB3400 is the newest in our lineup of battery tools for structural blind rivets. With the ability to pull the same rivets as our comparable pneumatic tools, the PB3400's performance is enhanced by the included DEWALT® batteries and chargers. Contact us today to learn more about pricing and how to order.